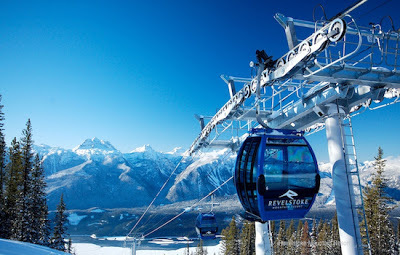 Formerly only open to hardy cat and heli skiers, Revelstoke is now a well-rounded family ski resort, with a chic new hotel, ritzy restaurants, tube park, beginner areas, plenty of blue runs and lots of new amenities – all with artful architecture and fancy foods. Revelstoke’s Sutton Place Hotel is located in the village base and offers luxury condominium style accommodation. It is adjacent to upmarket eateries such as the Rockford Wok Bar & Grill, La Baguette and the Mackenzie Common Tavern, as well as the Refinery Day Spa. The mountain offers a staggering vertical descent of 1,713 meters (5,620 feet), the highest in North America and offers incredible powder skiing in glades, bowls, chutes and from backcountry hikes such as Critical Mass and Greely Bowl. These areas are for experts who flock from Calgary, Vancouver and further afield to ski the tough runs. A Calgary skier, Bruce Palmer skis Revelstoke every season as well as his home playground of Banff and Lake Louise. 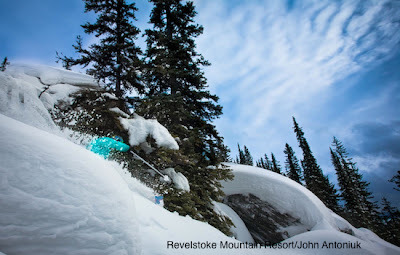 “You need to ski with a partner and be somewhat terrain savvy at Revelstoke,” he counsels. 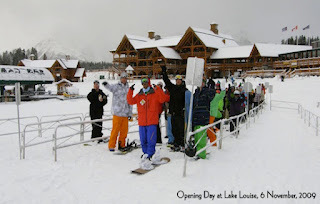 However, in keeping with its family focus, the resort has also developed beginners’ and intermediate areas at the top of the Revelation Gondola - all overlooking the vast vista of the Columbia River and the prominent peaks of Mt. Revelstoke National Park. There is also the Turtle Creek Beginner Area and Tube Park, Kids’ Revelstoke Outdoor Centre (ROC) programs both day and night, Mountain Child Care and babysitting services - all close to the hotel complex. Revelstoke is unusual in providing an entire resort lift system as well as cat-skiing and heli-skiing all from one main base. Cat-skiers get to ride to isolated areas inside a passenger snowcat in small groups and ski untouched powder snow all day. Heli-skiers can reach even further and higher areas for more untrammeled snow. 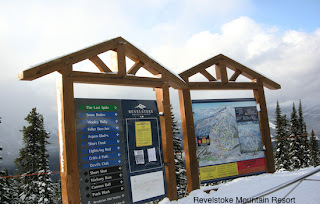 What’s also remarkable about Revelstoke is the length of each run. Every descent requires cardiovascular stamina as well as thigh power to keep going. At 15.4 km, the green Last Spike is considered the longest run in North America, second only in the world to France’s 16 km trail at Alpe D’Huez. Luckily there are several on-mountain eateries to rest and recover from the arduous skiing. The lift-accessed Revelation Lodge features stunning views over the Columbia Valley, a self-serve restaurant, espresso bar, and panoramic deck with barbeque. The MacKenzie Outpost at the top of the Revelation Gondola serves coffee and sandwiches amid stunning views of the Monashee mountains. And, back at base, La Baguette is a popular choice for breakfast, lunch and home-made gelato for an apres ski treat. Forward plans for Revelstoke include over 20 lifts, 100 or more runs, more accommodation, a golf course and over 500,000 square feet of commercial and retail space. Canadian skiing is characterized by powder snow over a long season in unspoilt national parks, craggy mountains and ancient forest replete with wildlife. Canadian ski resorts are dispersed over several distinctive sectors: the Alberta Rockies and British Columbia’s coast, interior and Rockies, in the West and the Quebec resorts in the East. Host to the 2010 Winter Olympics, Whistler Blackcomb near Vancouver is the pinnacle of BC’s coastal skiing. The double resort linked by the Peak 2 Peak gondola averages 10.42 metres of snowfall annually on 200 trails spread over 8171 acres. There are 37 lifts, five terrain parks and 17 mountain restaurants. Moving east through British Columbia, Big White and Silver Star dominate the interior Okanagan snowscape, boasting 750 cm of seasonal snowfall with champagne powder. 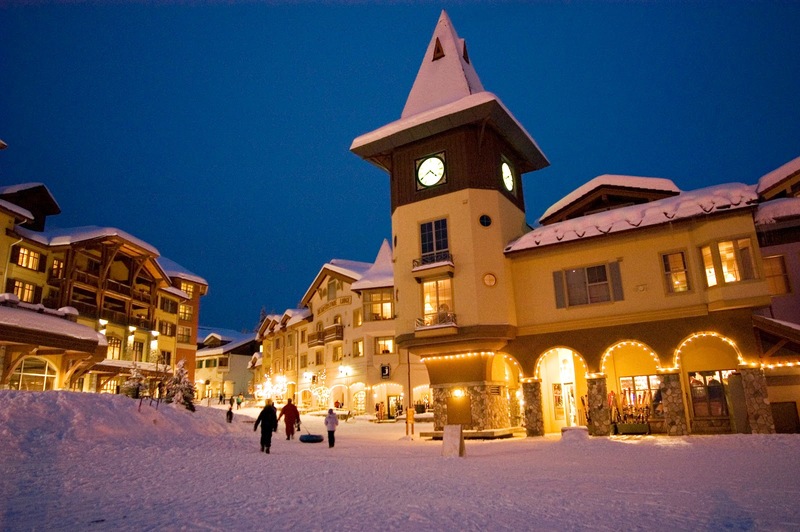 Next is Sun Peaks, a Tyrolean-themed village surrounded by the ski slopes of Tod Mountain, Sundance Mountain and Mt. Morrisey with 122 alpine runs, 12 gladed areas, two bowls and extensive cross-country and snow-shoe trails. 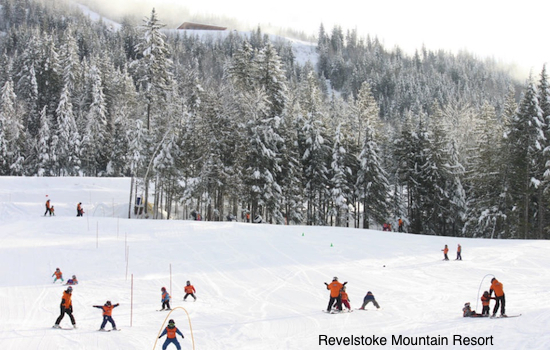 Revelstoke is a relative newcomer to BC’s ski offering, rivaling Whistler in elevation and vertical. 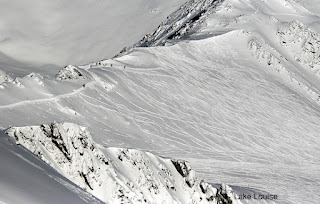 Up until 2007, Mount Mackenzie was only accessible to heli and cat skiers. Now there is a high-class resort next to the gondola, runs for every standard and you can still combine resort skiing with more adventurous backcountry forays by helicopter and snowcat. With 142 runs and tremendous tree skiing, Fernie is a BC favourite with many Calgary skiers and riders as well as international visitors. Famous for its five, bountiful bowls, it is owned by Resorts of the Canadian Rockies (RCR) which also owns neighbouring Kimberley and Kicking Horse, all in the Kootenay Rockies. Kimberley is a family resort with full resort amenities as well as night-skiing. Kicking Horse caters for both the aggressive skier with its ridge and chute skiing and beginners and families with a panoply of perfect beginner and intermediate runs and bowls. 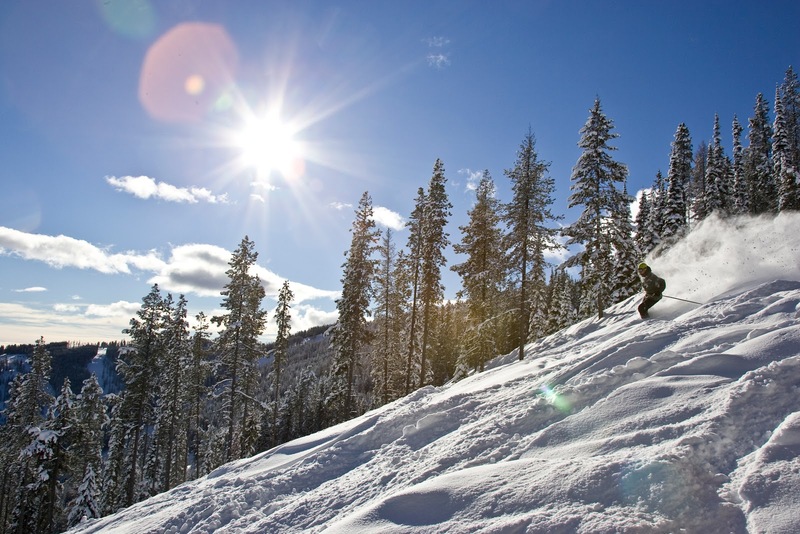 Panorama Mountain Village Resort has 2,847 acres of terrain, ranging from wide open fall-line cruisers to powder-filled tree lines, with 75 percent of runs for beginners or intermediates. Red Mountain has 88 runs, six lifts, a 7km cruiser, 750 cm of annual snowfall. 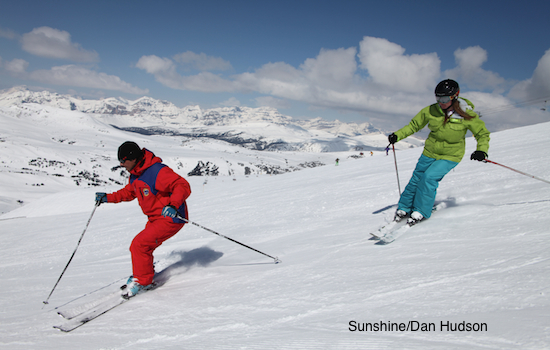 Alberta’s skiing is dominated by the Big Three - Lake Louise, Sunshine and Mt Norquay. Visitors can stay in Banff, a picture-perfect mountain town right in Banff National Park and ski all three resorts from the same lift pass. Alternatively they can stay onhill at Sunshine or in Lake Louise Village. 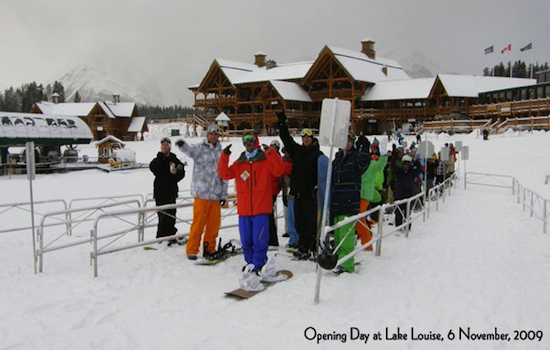 The Winterstart World Cup races in December draw thousands of international visitors each year to Lake Louise. 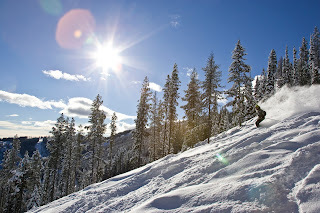 And Sunshine - where skiing goes on past mid-May - gets Hollywood limelight annually with its Waterkeepers Alliance benefit headed up by filmstar, Alec Baldwin. The nearest resort to Calgary is Nakiska, built for the Calgary Olympics in 1988 now a skiing and snowboard playground which hosts Olympic event training every season. Further south is Castle Mountain, a real local’s hill attracting junior race meets as well as powder-hunters to its often wind-sifted, powdery snow. It also features the cheapest cat-skiing in Canada. 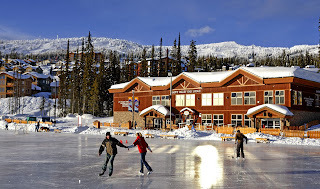 Around 6 hours from Calgary and 4 hours from Edmonton is Marmot Basin, Jasper’s ski resort where the most affluent skiers stay in the luxurious Jasper Park Lodge. 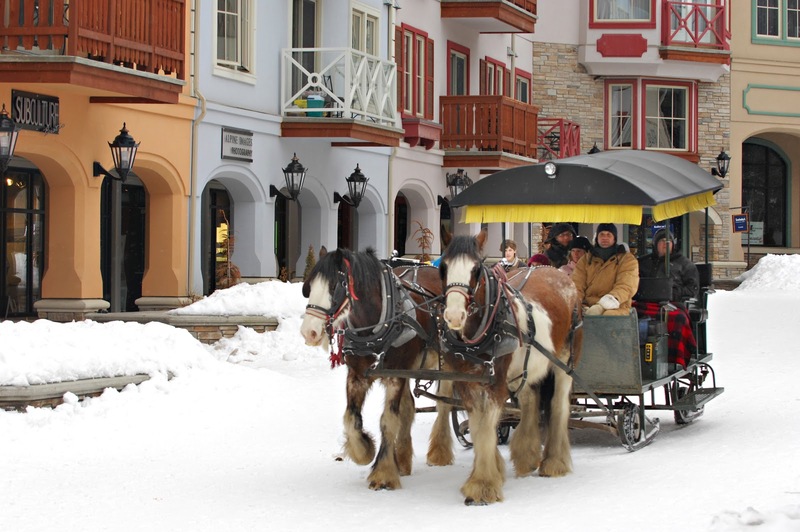 Further to the east of Canada in the Laurentian mountains, Quebec’s skiing is dominated by Mont Tremblant with its European-designed village, Mont Blanc, the second highest peak in the area, and MontSaint-Sauveur, famous for its extensive night-skiing. There are two resorts 30 minutes from Quebec City - Mont-Sainte-Anne overlooking the St Lawrence River and Stoneham, with 39 trails, 19 of which are lit for night-skiing. The Charlevoix area is home to Le Massif, with the highest vertical in Eastern Canada and 52 runs, and Grand-Fonds, known for high quality natural snow conditions over 14 alpine runs and140 km of cross-country ski trails. 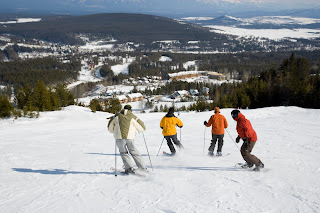 The Eastern Townships region has Bromont with145 trails and glade runs covering seven slopes; Mont Sutton, boasting 9 lifts, 4 mountain chalets, snowpark and 60 trails; Orford with 61 runs over three summits; and Owl’s Head, overlooking Lake Memphremagog with 45 trails serviced by 9 lifts. When you get to the top of the Sunshine Village gondola, you feel like you have been transported through the clouds to a magical land of snow-spangled mountains above the treetops. The vista is a vast swathe of white, sometimes sparkling in the sharp sunlight, more often being doused in massive flakes of powder-producing precipitation. Straddling both Alberta and British Columbia, Sunshine seems to benefit from the snow records of both the lee and windward side of the Rockies with a long snowy season extending from mid November and through most of May. Famous for hosting the ski events for the Waterkeepers’ Alliance charity weekend every Jan, Sunshine is the ski hill of choice for celebrities like Alec Baldwin, Michael Douglas, Robin Williams and Frazier’s Kelsey Grammer. They congregate annually for skiing, fun races and events mingling with locals and tourists. Sunshine also attracts skiers and snowboarders from all over the world anxious to taste that dry, fluffy snow in a resort which needs no snow cannons on the majority of its runs. The ski out back down to the gondola base is the only area which needs a manmade top-up occasionally. Elsewhere on the three mountains, the mountain ops team harvests snow against strategically-placed metal fences and redistributes it on runs as required. This can lead to some of the best corduroy in Canada - fresh snow re-formed into vertical runnels by snowcats and great for skimming along first thing in the morning. 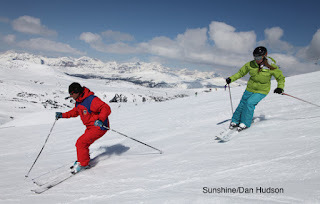 Beginners love Sunshine because of its centrally-located ski/snowboard school, Tiny Tigers daycare and Kids’ Kampus, great snow, perfect learning area or ‘bunny runs’, and the short but sweet green runs off the Strawberry Chair. All these facilities are clustered around Mad Trappers, a cute and cozy cabin perfect for rest, respite and restorative drinks and food. This cabin is named after Trapper Jerry (Jerry Kernen) who at 96 (in 2013) is still skiing and celebrates his birthday there on Feb 14 each season. There are multiple runs for beginners off most chairlifts and intermediates love Sunshine Coast on Goat’s Eye and Tin Can Alley off the Wawa Chair. Long and varied beginners/intermediate trails descend from the Angel Chair and interesting tree-lined greens and blues track further down to the gondola mid-station. Every lift at Sunshine also accesses black diamond runs surrounded by wide open snow fields and glades for carefree forays into powder and bumps. Unlike any other Canadian resort, Sunshine has developed two patrolled backcountry playgrounds - Delirium Dive and The Wild West. Attainable only via monitored gates, all users have to carry a backcountry safety kit including a beacon, shovel and probe. With a luxurious lodge nestled among the chairlift stations, it is a wonderful experience to stay onhill at Sunshine Mountain Lodge and savour the crowd-free slopes early morning and at day’s end. 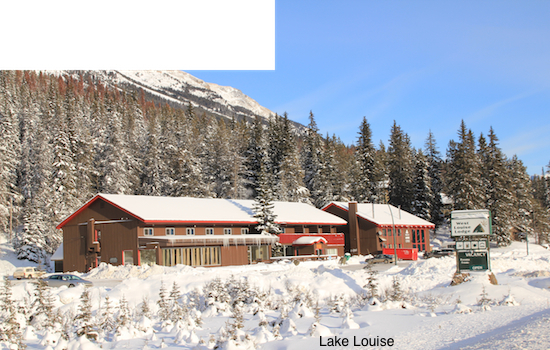 It is the only hotel reached by gondola in Canada and the only ski in/out ski hill accommodation in a National Park. The immense outdoor hot tub is the best way to loosen up querulous quads after skiing. Then, after dinner in casual Chimney Corner or upmarket Eagle’s Nest, you can stargaze without light pollution and imbibe the unique wilderness of Banff National Park - followed by a different kind of imbibing at Bruno’s pub opposite the lodge. The ski resort is privately owned by the Scurfield family who have modernized the lift system and also developed the onhill lodging into a state-of-the-art eco-boutique hotel with a $5million renovation. There are a wide variety of rooms to choose from, notably the premium West Wing suites with 27 foot windows overlooking Standish Mountain. Although, ironically, you might not be able to guarantee actual sunshine every time you go there, the 400 international staff who live on the hill make up for it with their sunny service. Other amenities: Terrain park; snowshoe trails; tobogganing nights; family movie and games rooms; hot tub; gym; spa; sports bar; fine dining; pub. 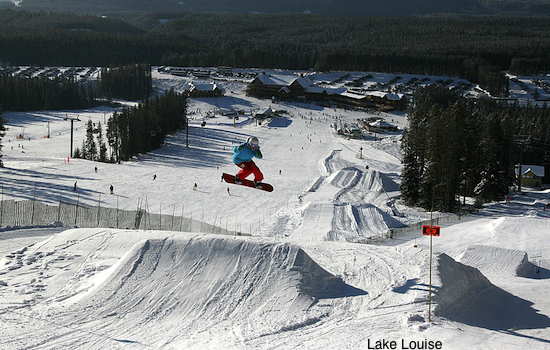 A UNESCO World Heritage Site,Lake Louise Ski Area is deemed the birthplace of wintersports in Canada. Dating back to 1931, the resort has become famous for early season World Championship ski racing in its stunning National Park setting. Host to the Winterstart races each year in early December, it has such a long snow season and great snow record that it has only had to postpone fixtures due to too much snow, never because of lack of snow like many European resorts. Apart from world class racing conditions, it is a haven for snowsports’ enthusiasts of all standards. For beginners there is an enclosed magic carpet area as well as a vast dedicated gentle slope with a long T-bar lift and a magic carpet - all set in beautiful fir trees near the lodge base. 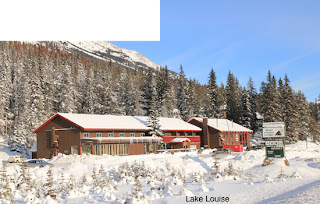 The Daycare Center overlooks this area and there is a great ski/snowboard school located nearby in the main lodge, offering group and private lessons for kids and adults. As beginners progress, they can easily ride a cosy gondola to the top of the mountain to appreciate the panoramic views over the actual Lake Louise which is on the opposite side of the valley. Bordered by imposing glaciers and overlooked by the French-inspired Chateau Lake Louise, this is a great place to visit after skiing, for the views, skating on the frozen lake and cross country trails. From the Grizzly Express Gondola, beginners can ski all the way over to the back of Lake Louise on Pika green run, a long, undulating path which leads to the scenic Temple Lodge and the slopes of Larch Mountain. As all the advanced runs also converge at Temple Lodge, it is a great place for lunch with a choice of outdoor barbecue, indoor self service or upscale restaurant and bar - all in a charismatic cabin. For more advanced skiers, Lake Louise is a powder paradise with bowls, glades and challenging chutes. The expert-only, Summit Platter lift services a pristine powder bowl complete with blacks, double blacks, narrow chutes and breathtaking ridge hikes. This area has a backcountry feel but with the security of being within bounds. There is also a blue run mapped out but it is more often a blue powder run rather than a blue groomer. One of the best things about Lake Louise is the family-friendly feel - everyone has an area which they can make their own to suit their ability. It is all utterly beautiful and so wild that you sometimes see elk or other animals in the forest or even on the slopes. It is bear habitat during the summer with warden-guided tours. The vast lodge at the base has the whole variety of eateries from buffet breakfasts and lunches, self-service snacks, Starbucks, full service restaurant and lounge and outdoor live music venue. The huge stone-clad fireplace and immense wooden rafters inside establish a relaxing atmosphere with a rustic-chic aesthetic enhanced by panoramic windows on every side. Fernie Alpine Resort dominates the recreational facilities in the Elk Valley, snuggled in the Canadian Rocky Mountains in southeast British Columbia. When staying at Fernie you have the difficult decision to face: whether to stay right on the hill at the charismatic mountain village or in the rambling, Victorian town full of history and character. What you don’t want is just one day in Fernie - there is too much skiing to fit in and lots of lively après ski. Luckily, the resort is just 10 minutes drive (or shuttle bus) from town, so whether you stay onhill or in town, you get the chance to enjoy both. The resort itself encompasses lodges, restaurants, bars, hotels, shops and ski school all around the base of five alpine bowls, 142 runs and magnificent mountains. There’s a great balance of novice, intermediate and advanced skiing at Fernie but due to its huge acreage, there is actually more expert terrain than the entire size of many other North American ski resorts. Most of the mountain is heavily wooded with only the tops of the chairlifts - such as the brand new Polar Peak Quad and the White Pass Quad - emerging into pure white slopes. The snow-glistening glades are great fun with plenty of pitches to appeal to intermediate, as well as advanced, skiers. With such variety and complexity of terrain, it’s best to get an instructor to show you around on your first visit. Fernie’s hosting service is another valuable tool for newcomers. Every day there are morning and afternoon tours, free of charge, where local volunteers guide groups of similar ability around the slopes, pathways and bowls. As well as cataloging the skiing, the hosts also give an overview of the history and geography of the area with ancient tales of mining, prohibition, ghosts and intrigue. The Griz is one local myth - a giant, hairy character, half ape, half man, who is supposed to haunt the mountains. Named after him, the après ski bar at the base of the hill is the scene of much drinking and dancing at the end of each ski day – no kids allowed. 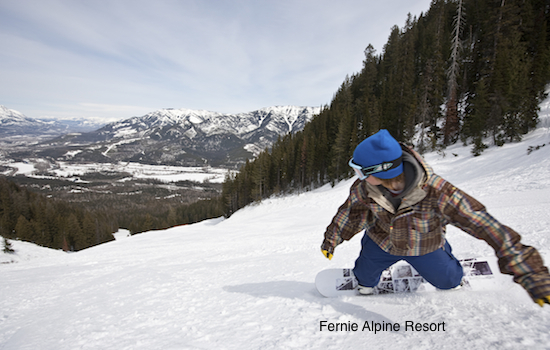 Fernie is famous for its powder snow, drawing tourists and itinerant workers from all over the world. Scottish physiotherapist, Aileen Thom took a year off from her career to ski and work at Fernie. With a season’s ski pass as part of her job, she was astonished by the amount of snow there. “Fernie has an excess of snow compared to Scotland and it is steeper than where I have skied in Europe,” she comments. But even on a dry day at Fernie there is plenty of skiing. Snow guns fill in any gaps on the lower runs and, with no crowds during weekdays, skiers enjoy hard-packed heaven on long groomers with wind-sifted powder in bordering gullies. Apart from local legends, Fernie harbours another secret - a hidden-away ski shop with old-fashioned personal service. Called Top Shelf Snowsports, this social hub in the basement of the Griz Inn attracts instructors, patrollers, national ski teams, pro skiers, resort staff, Fernie’s ski bums and tourists looking for more comfort and performance from their ski boots. Good boots, however, are not just for pros. Owner Donny Dion rents out $500 boots to newbies for just $20 per day. “Give new skiers the best first experience with the equipment to match the terrain and boots that fit and there’s more chance that they’ll enjoy and continue in the sport,” he explains. Revelstoke’s brand new Sutton Place Hotel is a luxury condominium with a brand new swimming pool and hot tub facility, adjacent to upmarket eateries such as the Rockford Wok Bar & Grill and Wino’s for great apres-ski. Rentals, retail and guest services are also close by. The mountain offers a staggering vertical descent of 1,713 meters (5,620 feet), one of the highest in North America with incredible powder skiing in glades, bowls, chutes and from backcountry hikes such as Critical Mass and Greely Bowl. These areas are for experts who flock from Calgary, Vancouver and further afield to ski the tough runs. A Calgary skier, Bruce Palmer skis Revelstoke every season as well as his home playground of Banff and Lake Louise. 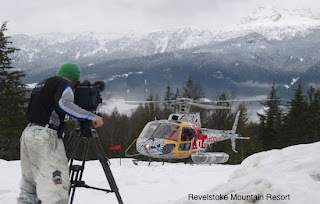 “You need to ski with a partner and be somewhat terrain savvy at Revelstoke,” he counsels. What’s also remarkable about Revelstoke is the length of each run. Every descent requires cardiovascular stamina as well as thigh power to keep going. At 13.2 km, the blue/green Last Spike is considered the longest run in North America, second only in the world to France’s 16 km trail at Alpe D’Huez. Luckily there are several on-mountain eateries to rest and recover from the arduous skiing. The lift-accessed Mid-Mountain Lodge features stunning views over the Columbia Valley, a self-serve restaurant, espresso bar, and panoramic deck with barbeque. The MacKenzie Outpost at the top of the Revelation Gondola serves coffee and sandwiches amid stunning views of the Monashee mountains. And, back at base, La Baguette is a popular choice for breakfast, lunch and home-made gelato for an apres ski treat. A family ski vacation can often require tons of energy just getting to the accommodation, navigating all the slopes and stairs weighed down by skis, luggage and over-excited kids. Then getting to and from the ski area can be a challenging chore each day. But one BC ski resort is taking away most of the physical strain with its empathetic environment and family-friendly features. Sun Peaks, near Kamloops (eight hours drive from Calgary), was designed by Paul Mathews who combined artful architecture with parent practicalities. Maintaining that ski boots – not to mention strollers - are dysfunctional on steps, he avoided using staircases in the village center and around the lifts. He also made the whole resort ski in/ski out and created wide roads to enable ploughs to clear slippery snow and allow horse-drawn carriages to parade right through the village. Arriving at the resort feels like being magically transported to the Alps - it’s like skiing in Europe without the exorbitant airline fares. Mathews’ decorative motif emulates San Lorenzo on the Italian/Austrian border in the Sud Tyrol, with ornately carved balconies, wooden shutters around multi-faceted windows, and hand-painted murals around doorways. Snow-clad roofs are prettily pointed and gabled and there’s a steepled clocktower near the ski slopes which conveniently horse-shoe the village. 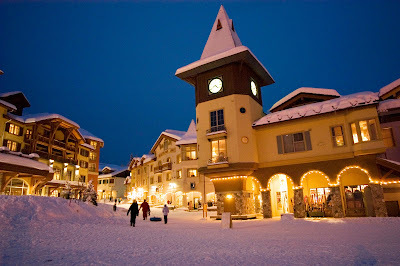 If Walt Disney had designed a Winter Wonderland, Sun Peaks would be it! Mathews - President of ski hill architects, Ecosign - devised a 25-year master plan back in 1993, utilizing the best of Italian flair with Austrian craftsmanship to create a timeless resort at the former Tod Mountain. “So many other resorts reflect the decade they were built in so they soon look dated,” he explained. The 124-run resort is positioned on the windward side of the Rockies, scooping copious coastal precipitation after it has dumped its wetter snow on more westerly resorts. The 559cm of annual snowfall, which blankets the tiled roofs and steeples, is light, fluffy champagne powder with no need for snowmaking beyond early season. Attention was given to ensure that there are beginner, intermediate and advanced runs from the top of every chairlift, accessing 3,678 acres of terrain over three mountains – another bonus for fledgling family skiers and snowboarders. Known by children all over Canada as the figurehead of junior ski racing, Nancy Greene is Sun Peak’s Director of Skiing as well as being a major investor in the resort. Despite her work as a Senator, the Olympic Gold Medalist still conducts afternoon tours at weekends from the Sundance Lift. Medals and trophies from her illustrious ski racing career are showcased in the Nancy Greene Cahilty Lodge – built by Greene and her husband, Al Raine. Ski school starts at age 3 with the ‘Sun Tots’ group where one-to-one lessons give toddlers technical tips and reassure parents that their child is being given personal attention (http://www.sunpeaksresort.com/sports-school/sun-tots). 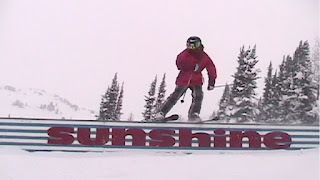 Childminding is also available and daycare starts at 18 months at the Sundance Kids Center (http://www.sunpeaksresort.com/sports-school/sundance-kids-centre). Getting to and fro is made easier at weekends and public holidays with the resort transit service. There is every type of lodging at Sun Peaks, from hotel rooms and chalets to condos and self-catering units, with packages and discounted deals available throughout the season. 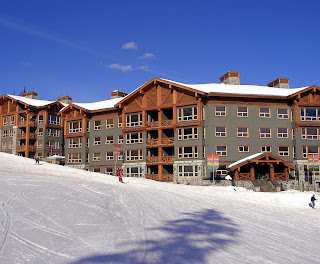 Mimicking an Austrian pension, Sun Peaks Lodge is right on Main Street and a quick ski down to the lift area, ticket offices, daylodge and ski school (www.sunpeakslodge.com). At day’s end, a judicious choice of east village runs enables smooth skiing back home to be greeted by gregarious German owners, Sylvia and Mario Erler, with old-world courtesy. In the company of German ski groups, surrounded by European decor and menus, après ski in the Steakhouse feels miles away from everyday Canadian life. Because Sun Peaks targets the whole family there’s something for everyone: spa, sports center, snowshoeing, cross country skiing, skating, nightskiing, terrain parks, tubing, cat trax rides, sleigh rides, dogsledding, Euro bungee, snowmobiling, shops, cafes, restaurants, galleries and musical concerts. There’s a season-long events calendar with highlights such as the Family Cup (Jan 2-16 - http://sunpeaksfamilycup.com/) and the Festival of Wine (Jan 12-20). Weekly Family Nights are held on Wednesdays at the outdoor skating rink with bonfires, roasting marshmallows and games. 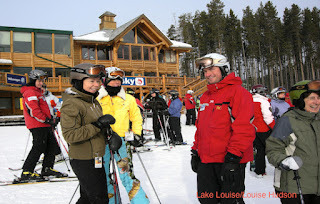 Go to www.sunpeaksresort.com for details of all activities. For those who have to bring the family dog, too, there’s the Wagging Tail Kennel en route to Sun Peaks for doggy daycare. 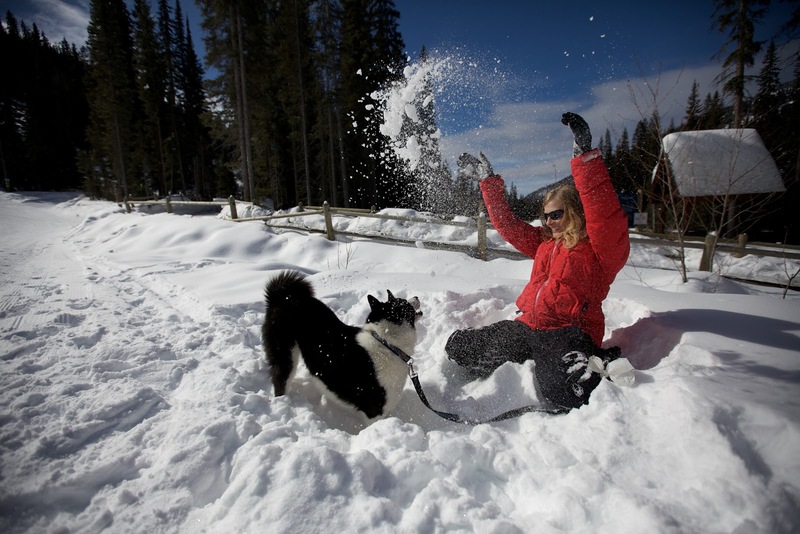 There’s even a pet-friendly Nordic track – the McGillivray Lake Trail – and many of the hotels and condos allow dogs. Check out the Rocky Mountain Chocolate Factory for doggy treats as well as Upper Levels Catering for canine cookies. Finding a labyrinthine layout of 80 great runs and glades can be a bit of a surprise at Kimberley, BC. Often overshadowed by Fernie, this ‘little sister’ resort is more extensive than most skiers anticipate. From five lifts, the diverse terrain comprises 80 runs over 1800 acres in the Purcell Mountains. 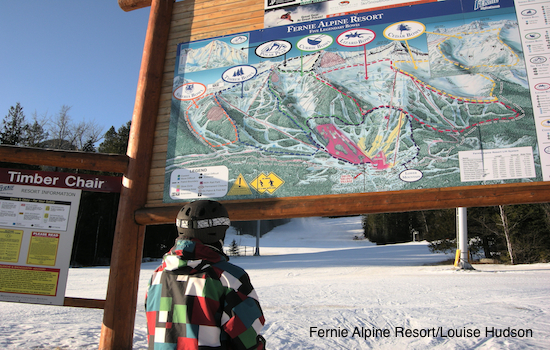 To put that into perspective, Fernie has 2504 acres with 142 trails from 10 lifts. 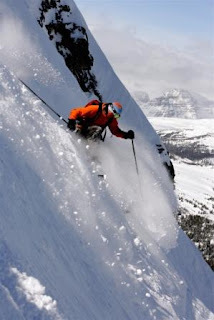 Nakiska – another Resorts of the Canadian Rockies’ hill - has 71 runs over 1021 acres. First-timers are continually impressed by Kimberley’s diversity. 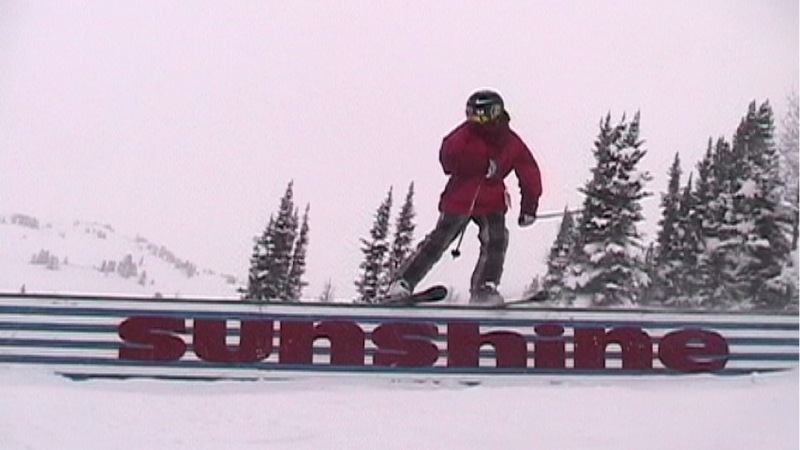 Will Smit - a feisty snowboarder from Calgary - loved the ungroomed areas. “I liked the natural features in the glades and the spacing of the trees was great. You can carve between the trees and there are lots of tree jibs and pillows,” says Smit. “It’s like a huge, natural terrain park.” There’s also a supervised, manmade rail park with around 16 different features. The skiing is intrinsically recreational with no precipitous ridges or death-defying cornices to intimidate skiers. There are wonderful cruisy groomers for beginners (20 per cent of terrain) with substantial snowmaking capacity on the frontside. Intermediates have 42 per cent of the Purcell Mountains’ topography to challenge them and there are intricate glades, long mogul runs and copious chutes for more advanced riders. Parents can feel relatively safe giving their older kids free rein to roam the slopes and rail park. If they miss the last lift back from Easter Bowl, there’s a winding cat-track leading them home. Resort Guest Guide, Murray Johnson has been skiing Kimberley since he retired there eight years ago. “Many of the runs are long and challenging,” says Johnson, who guides Canadian and international skiers around the hill throughout the season. He’s always amused by their first impressions: “They all say it’s much bigger than they expected,” he says. 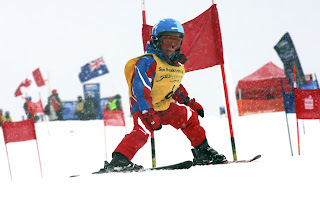 Having raised an Olympic Freestyle competitor – Ryan Johnson – the gregarious guide often skis Kimberley with his grandchildren nowadays. “It’s the perfect place to retire to and my grandkids love coming here,” he says. After a morning’s guiding, Kimberley’s team of 15 ski guides often congregates at Kootenay Haus for lunch and guitar jams. 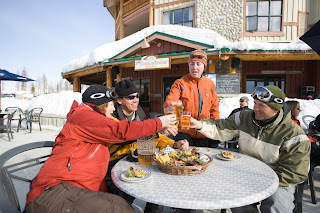 The timbered, mid-mountain daylodge is accessed by the Kootenay Connector from the Northstar Express Quad and is a great spot for bagged lunches, laid-back patio pauses and special fondue evenings. Only crowded at Christmas and February Family Weekend, Kimberley is tranquil most of the four-month season: “You get lots of dry, light powder here and because it’s so quiet you get to ski fresh tracks even several days after it falls,” says Johnson. Another Kimberley icon is the manmade Sun Pit, carved from snow each year at the top of a short hike from the Vimy Ridge run. Constructed by locals to resemble an open-top igloo, it usually has tiered seating and a corner stage for impromptu musical displays. This unofficial, “adult only” area is used for beer breaks and sun-tanning sessions, with a fun ski down at dusk after the lifts have closed. The four-season resort is centred around Trickle Creek Lodge which houses Montana’s Cookhouse as well as a new fireside café for laid-back lunch breaks. The rustic, timbered balconies overlook the slopes as well as the large outdoor pool and hot tub area. The commodious ski in/out condo apartments also access golf, fly fishing, hiking, biking, kayaking, rafting and spas in summer – check out www.tricklecreeklodge.com. 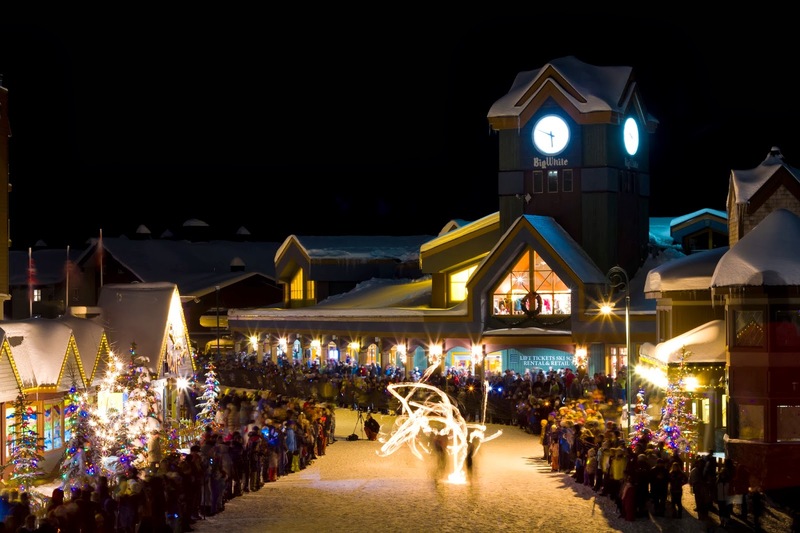 Kimberley’s resort centre is dominated by the Alpine-style clock tower above the main après-ski spot, Stemwinder Bar & Grill. Next door is Slopestyle Cafe with its obligatory Starbucks fix plus self-service restaurant and base daylodge facilities. Guest services organizes a full activity schedule including night skiing, moonlight mountaintop snowshoe fondue tours, Nordic skiing, heli sightseeing, dogsledding, and snowmobiling. 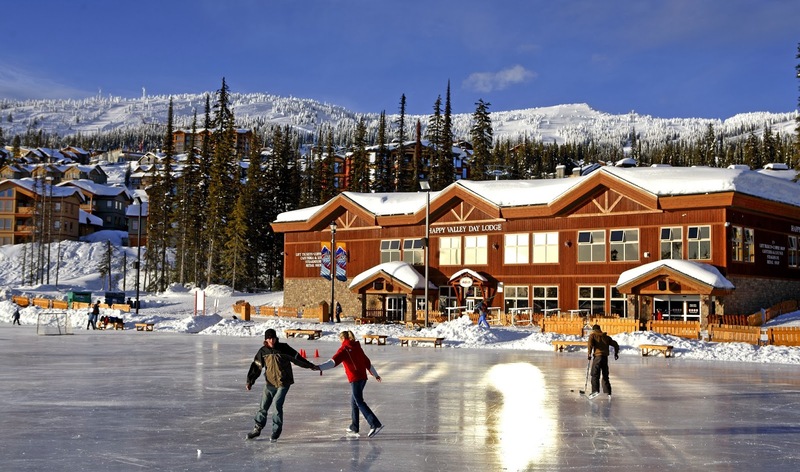 And there’s an outdoor skating rink right next door to Trickle Creek Lodge. Known as the Bavarian City of the Rockies, a visit to the German-themed town centre is a must to enjoy the cuckoo clock décor and tasty European fare. The most famous eatery is the 350-year-old Old Bauernhaus which was brought all the way from Germany, dismantled and then reassembled on the side of the mountain just down the road from Kimberley Resort. Food here is lavish, particularly the Bavarian Feast which is a 7-course taster banquet. Another locals’ hangout in town, the Pedal and Tap has chosen to forgo the Bavarian motif, positioning itself instead as an outdoorsy, modern, bike-themed nightspot with great food, reasonable prices and inventive menu. New this winter is a ‘Spring Splash’ event, a season finale of 80s-themed activities including live music, slush skimming contests, dummy downhill toboggan race, barbecue and beer gardens. “With our 80s theme and music, we hope to bring out all generations,” says new business development manager, Jeff Bazley. “Especially older people with their Sunice one-pieces.” He expects most of the contestants to dress up in 80s gear for the spring splash where they attempt to skim across a 30-foot stretch of water after schussing down a 100-foot slope. As we mature, our ski needs start to change: comfort, softer snow, better piste grooming, easy access, no walking or carrying, activities for rest days and luxurious accommodation begin to take precedence over the less pernickety requirements of gung-ho youth. Fed up with diminutive European apartments and noisy chalet sharing, many of us crave a commodious condo with all the technological trappings of home and a few extra luxuries. If we’re still skiing in our 50s and beyond we deserve it! 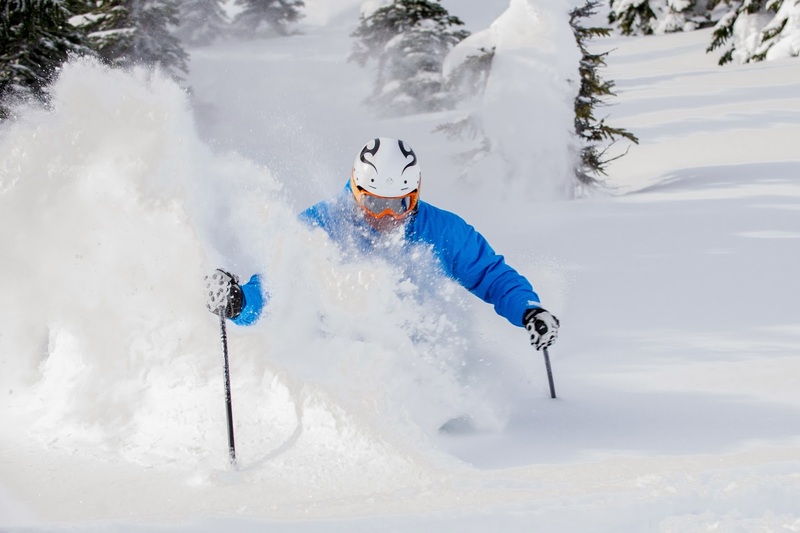 That’s when resorts like Big White in Canada really come into their own. Apartment buildings such as the Stonebridge where I stayed last spring are set right on the slopes with skiing going on above and below. Not only could I ski to and from my ski locker (which seemed bigger than some French apartments I’ve stayed in), but the village was also right there, a snowball’s thrown from my hot tub patio. Having my own outdoor Jacuzzi sealed the deal for me! The apartments are spacious and luxurious with everything including the kitchen sink and, of course, those crucial conveniences: a washing machine and tumble dryer – essential for revitalizing undies and drying snow-soaked outerwear. And I really did get drenched in oodles of soft white powder snow that just kept on pouring down while I was there. As the name suggests, Big White prides itself on its amplitude of snow and loves to show off its snow ghosts in photos – high altitude fir trees clothed in thick white winter coats that stay that way all season long. The summit looks like remote heli-skiing terrain, straight out of a Warren Miller movie set in the wilds of Alaska. In April, the pistes were meticulously manicured every night (no late season laziness from the groomers) and the glades and bowls kept replenishing with regular spring snowfalls. Every time I strayed into the meandering glades, my previous tracks were already engulfed. And, yes, there were only my tracks there in the first place as I timed my trip just after the Easter holidays so there were few people on the slopes. This made dinner reservations easy, too, on the odd occasion when I wanted to leave my full kitchen and massive fridge freezer. Smack in the middle of British Columbia, the best airport to access Big White is Kelowna International Airport which links directly to Los Angeles. With the two-center trend for vacations these days, how about a mélange of Magic Kingdom and Winter Wonderland, combining California and Canada in the same trip? If you have the time, you can combine a winter or spring trip to LA for golf, beach (and Disney for those who can bear it) with a ski trip to Big White. Alternatively, you can fly directly into Vancouver or Calgary and then hop across to Kelowna followed by a 55-minute ride to the resort. If you go in spring like I did, you may be able to ski at the 7606-ft elevation in the morning and play golf just half an hour away in the Okanagan Valley in the afternoon. Big White dubs itself Canada’s second largest ski resort (after Whistler). The piste, park and powder playground is perched on the highest mountain in the Beaverdell Range. 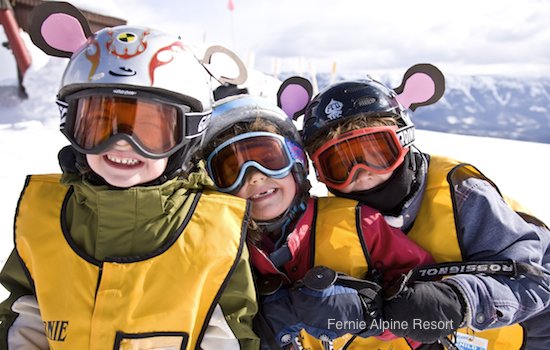 For multi-generational trips there’s a topnotch kids club and GPS-monitored ski school where instructors will even transport kids to and from their accommodation. A special “Mom, Dad and Me” program enables parent (or grandparent) and child to take a two-hour private lesson so you can learn teaching tactics to use the rest of your holiday. If anyone in your party doesn’t want to ski or snowboard, they can take a chauffeured “snow limo” to see the slopes from the skier’s perspective. Big White’s 16 lifts cover 2765 acres of patrolled slopes with a bias towards intermediate terrain, absolutely ideal for obstacle-free, cruisy skiing. Natural high-altitude glading means all the runs have accessible glades in between enabling mid-standard skiers to try them out. For the daring, there’s also extreme skiing in the Cliff area and plenty of black runs around Gem Lake. The Telus terrain park has its own chairlift, boarder cross and skier cross courses, half pipe and a wide array of rails and jumps with loud music and free WiFi – keeping the riskier riders and twin tip brigade in their own designated area. You don’t even have to memorize the piste map: there are free Snow Hosts who will guide you around the mountain every morning. It’s a great way to get your bearings on the first day or two, taking the navigational stress out of skiing. The hosts – who tend to be retirees - know every inch of the terrain, weather patterns, amenities and history of the area. You can join them regardless of your ski ability in groups of similar ability family, friends or singles. In fact, if you are skiing alone, it’s an easy way to have companionship and safe skiing. Safety is a big deal at Big White which has developed special “Family/Seniors Skiing and Snowboarding Zones”. Three runs are selected each day with noticeable signage, gated entry and the addition of extra slope watchers to ensure that speed, safe skiing and riding are monitored. These are not the typical slow, green runs but a variety of standards. 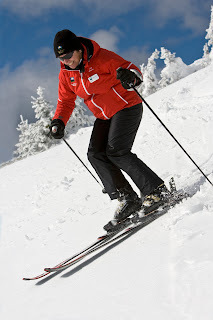 Coming up Feb 2-7 is Masters SkiWeek dedicated to the over 50s. 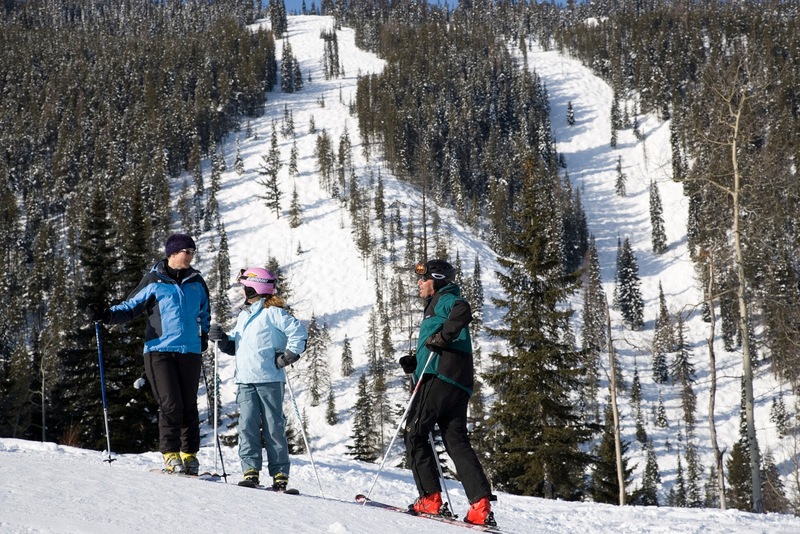 As well as ski tips, there will be a variety of activities and events, slope side accommodations, Okanagan wine sampling and informative seminars. 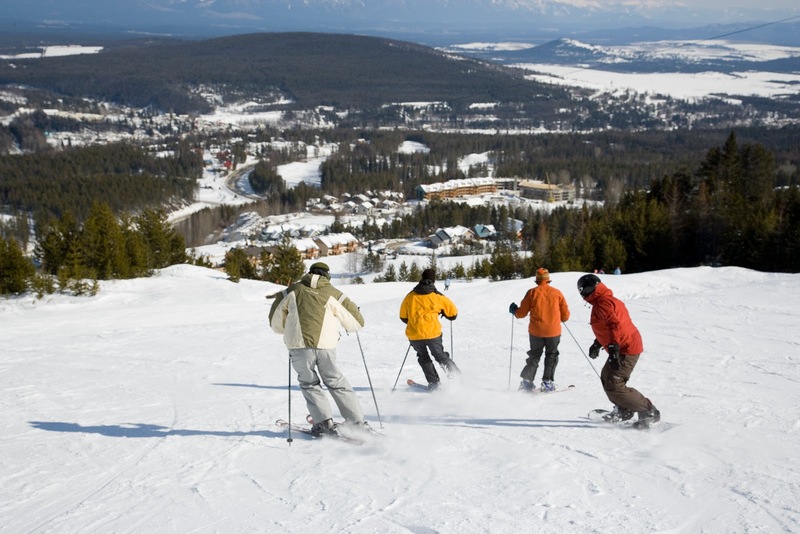 For energetic après ski, there are over 15 miles of Nordic skiing, a 147-acre night skiing park, snow tubing, skating, ice climbing and snowshoeing. And for more laid back evenings, Happy Valley Lodge, linked to the main village by gondola, has lively, musical happy hours. Follow this with fine-dining at Kettle Valley Steakhouse and you’ll feel as though you’re in St Moritz or Aspen, with rarefied silver service, AAA Alberta steaks, succulent lamb dishes, seafood, and award-winning Okanagan wines. The village is full of eclectic restaurants, a useful Market and Deli for self-catering, and a few fancy (but reasonably priced) ski shops. When you’ve O.D.ed on nachos and burgers, there’s Alpine fare at The Black Diamond, which serves cheese fondu, rosti dishes and Hungarian goulash soup. All of these restaurants are accessible both day and night. Dollars go much further than the Euro so you can afford to splurge! Accommodation options, linked by chairlifts and pedestrian gondolas, include three hotels, 25 condo complexes, 244 vacation homes and a ski in/out youth hostel. For those who dream of owning their own mountain maison or chic chalet, this could be the place. With prices plummeting faster than boarder-cross competitors over the recent recession-riddled years, three-bedroom condos on the slopes are going for around $350,000 right now. Now that lower European resorts are becoming less reliable for snow, Canada is really becoming the better choice. But what about the cold, I can hear you asking? Actually British Columbia has a mild climate (comparatively) with temps averaging -10C (low) and -1C (high) between December and April. Just make sure to bring layered clothing, face warmers, and nifty inventions such as Volt’s rechargeable battery-heated vests or the latest Heat-Touch push-button rechargeable gloves by Seirus. Every time I wear mine, someone asks me where I got them, even asking to photograph them in order to remember the brand! Average snowfall at BigWhite is 24.5 feet each winter so you can just imagine how it piles up as the season goes on. Having also skied masses of powder there in mid-December, I’m in a good position to say that Big White is very well-named. Your blog is very nice and informatics we are waiting your next update. known for the best breakfast restaurants Toronto. We hope you enjoy our food and find our online Delicious Food Restaurant order services. We always serve delicious food at your table. Our prime focus is to bring a smile on your face by the help of our food quality. Find Exclusive Deals On Portable Fridges Freezers, High Performance Cooler, and Rotomolded Cooler etc.